On this route, you travel back in time during your visits on the countless magnificent wrecks the Red Sea offers. Not only will you be charmed by these mysterious time capsules, but these adventurous dives will be combined with lazy diving on the beautiful dropoffs and fish-filled off shore reefs with abundant coral cover. This giant horseshoe shaped reef has different diving locations with an array of marine life. The northern tip is built from huge chunks of coral with abundant vegetation and therefore a fairly good chance on spotting turtles. Due to the fact that during the months of February and March some manta rays find shelter here, this location is sometimes referred to as “Manta Point”. On the east side you will find a coral covered drop off, while the southern part of this reef shows a 12 meter (40 ft) sandy plateau amidst some big coral blocks. This reef encircles a shallow laguna in which the diver finds coral edges and small pinnacles. You wouldn’t be the first diver to experience a dive filled with dolphin play ! This reef is only uncovered at extremely low tide and is situated in the edge of the Suez Canal / Strait of Gubal exit, one of the busiest shipping routes in the world. Hence, near this reef wrecks are plentiful. The north side of the reef wrecked 4 of the most famous wrecks divers can discover : Giannis D, Carnatic, Chrisoula K and Kimon M. The wrecks are right next to the reef on the sandy bottom, with a maximum depth of 30 meters (100 ft). Giannis D is one of the most intensely dived wrecks in the Abu Nuhas area, and for many it’s also the most appreciated one. After this Greek freighter loaded with wood hit the reef on April 19th, 1983, the ship slowly cracked and split in 2 pieces. It would take the broken vessel 2 weeks to slowly disappear under the Red Sea surface. The wreck is turned over on its port side in 28 meters (92 ft) of water. Must see’s are the intact bow and glassfish filled engine room. The double mast, wiring and cables are embedded in soft corals. Giannis D is easily accessible, but its slanted position can cause some vertigo. The diversity of species like lion- and scorpionfish give this dive something extra. The Chrisoula K, built in Germany in 1954, was acquired by the Greek Clarion Marine Company in 1979. On August 31st, 1981 the ship was sailing from Italy to Jeddah where it would discharge its cargo of Italian floor tiles. Tragically, also this vessel stranded on the Abu Nuhas reef edge, probably due to a navigational error of the captain or one of the officers. The ship slammed into the reef at full speed and snapped in the middle. The bow rested on top of the reef for a while, but the often forceful waves in this area also claimed this part of the unfortunate vessel that is now at rest on its starboard side. After more than 20 years in the water, the sea transformed this chunk of iron into a hard and soft coral covered and fish-ridden work of art to be enjoyed by all divers. Because of the instable position and narrow entrances and exits, it is recommended not to enter this wreck. During the night of September 13 -14 the leaks grew bigger and the generators had quit. And so did the pumps, so 34 hours after the collision the ship broke in half and the stern disappeared under the waves. Shortly thereafter also the bow slipped down. The main part of the cargo (the story goes that 40.000 pounds sterling in gold bullion was on board) was never found nor recovered. 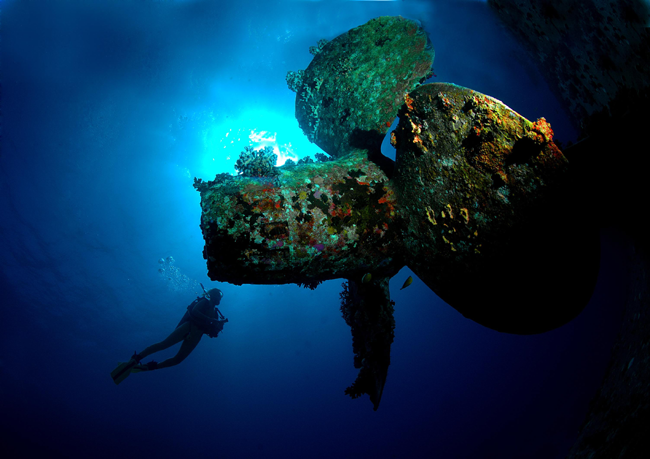 The wreck lies between 17 and 27 meters (56-89 ft) of water and is sometimes called the “wine wreck” after the plentiful load of wine bottles of which many were found by divers. Numerous glassfish and some grouper live inside this wreck. The hull is now covered with brightly colored soft corals, and sometimes morays and octopus are seen in and around the wreck. It is 1:30 in the morning when the SS Thistlegorm, anchored near Shaab Ali and filled with ammunition for the British African Corps stationed in Northern Africa, was spotted by the German air force. A short, but fierce fight follows, in which the SS Thistlegorm is ripped open by two fatal bomb hits. And swiftly she sinks to oblivion. The war rages over the world, and the ship is forgotten until no other than Jacques Cousteau himself stumbles upon her in the 60’s. The cargo, consisting of locomotives, motorbikes, jeeps, trucks, tires, rubber boats, ammunition, grenades and much more, remained virtually intact over all these years. Not only the ship itself, but also the riches of fish that crowded this wreck in all this time, make this ship one of the most intensely dived and famous wrecks in the world. Due to the size of this vessel, and the long list of things to see, it is recommended to make at least two dives here. The deepest point, to be explored during the first dive, is at 31 meters (102 ft). Strong currents are common over this wreck, and visibility is not always up to Red Sea standards, but nevertheless this wreck is a definite must-see for every diver. Januari, 22nd 1881. The Kingston, under command of captain Cousins, sets off from London harbour with destination Aden, her holds filled with coal. About one month later, the ship reaches the Red Sea and sails in open water. After a 48 hour shift, the captain feels the water is safe enough to trust the helm to his first officer and retires to his quarters. Shortly hereafter, the ship hits the Shag Rock reef at full speed. For two long days, the captain and his crew make attempts to free the ship from the reef, but to no avail. The Kingston slides down the reef and soon only the mast is visible protruding from the waves. More than 100 years later, this ship is one of the most dived wrecks in het Red Sea. And still, after all these years, she is in remarkably good condition. Egypt, October, 7th 1941, second world war. The Rosalie Moller, a British warship charged with “Best Welsh” coal, waits, like the Thistlegorm, for instructions to continue its journey through the Gulf of Suez. It’s this wait that will prove fatal to both these ships. After their attack on Thistlegorm, the German Luftwaffe found out that more ships were hiding in these “safe” waters around Gubal. Just 48 hours after the demise of the Thistlegorm, also the Rosalie Moller is destroyed by the Germans. At night, the ship is hit by 2 heavy bombs and disappears in the dark water together with 2 of its crew. The wreck is standing on the seabed in an upright position with the bows at 39 meters (128 ft) and a maximum depth of 50 meters (164 ft). The Rosalie Moller is still in mint condition, has an excessive coral growth on its decks and marine life can only be described as spectacular. Diving on the Rosemarie Moller is advised to be done only in good weather conditions, but if you are an somewhat experienced diver and get the chance to dive her : don’t miss out on it ! This reef encircles the Big Siyul island and offers an enormous variety : everything between wide sandy roads and hard coral ridges. The reef is alive with hard and soft corals. Especially the north side of this reef shows a dense encrustation of coral formations. But it is unprotected and sometimes victim to wind and waves. The seabed on the eastern side of this reef slopes down from 10 to +40 meters (33 – +130 ft). You may very well see a shark or a big ray here. Contrary to its name (the Arabic word “seghir” means “small”), this reef is one of the biggest in the neighbourhood. Usually drift dives are made here. You start from the north side and let the current push you south towards the anchored boat. During the dive you will be enchanted by the never ending coral fields, both hard and soft, and the great mix of marine creatures that inhabit this reef. The north part of this reef can only be reached in ideal weather conditions. This dive site consists of a crack, or narrow crevasse, in the Shaab Mahmoud reef. The combination of hard and soft corals here, is of breathtaking beauty. The tides create strong currents here. And where there’s current, there’s life ! This dive site, situated in the southern entry of the Strait of Gubal, consists of a steep wall with many small caves and cracks that house a great diversity of marine species. This rocky wall also forms the basis for enormous gorgonians. Around the reef divers can find glassfish, butterflyfish, crocodilefish and scorpionfish. Turtles and napoleonfish are amongst the possibilities. During your dive, you will also notice an unknown wreck situated a few hundred meters to the north of the lighthouse. This coral covered wreck stretches down from 2 meters (7 ft) to 25 meters (82 ft). Bluff Point owes its name to the strong currents that often sweep the east side of Gubal island. The island Umm Gamar, or Mother (Umm) of the Moon (Gamar), has several beautiful dive spots. In the south there is a plateau, covered in soft corals, on which morays, butterfly fish, Moorish idols, turtles and napoleons thrive. The 3 small pinnacles in the corner are crawling with glassfish. Umm Gamar also has drift diving facilities on the east and west sides. On the north of the island, only to be dived in fair weather conditions, there is a beautiful drop off with lots of marine life inside the big number of small holes and fissures.